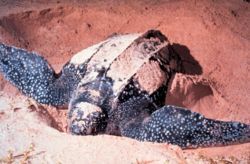 Even though leatherback sea turtles can live about 150 years, they are now registered as an endangered species. Though their meat is not used for food, their eggs have been considered a good food resource. This page was last modified on 6 January 2011, at 17:43.